Tiles or Studs: Ahoy Captain! 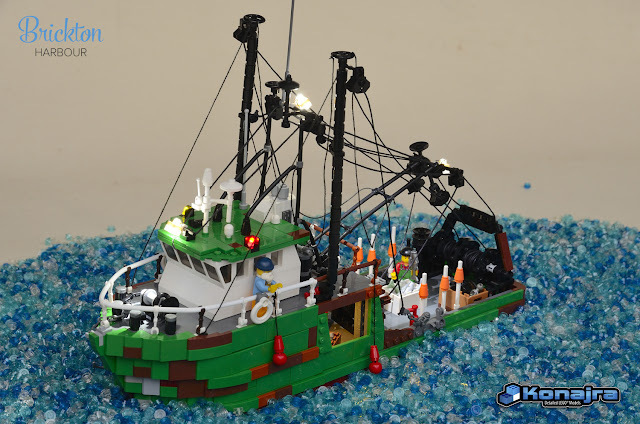 One of my favorite professional MOCer Arjan Oude Kotte (aka Konajra) shared a minifigure-sized vessel model for his Brickton Harbour. The Longliner Vessel is surrounded by many ropes, have well scaled captain cabin and a wide deck back of the ship. As a naval engineer I mostly liked small red fenders of the ship. Huge Optimus Prime by Nicola S.